The air service Lancaster County enjoys today is a direct result of the tireless efforts of hundreds of residents, government, business and community leaders over 75 years ago. The original Lancaster Airport was privately owned. Located in Lancaster on the Manheim Pike, it was the only real airport in Lancaster County in the early 1930’s. In 1933, the “Lancaster Joint Aviation Committee,” popularly known as the “Citizen’s Airport Committee,” was formed. They felt the time was right for a municipally owned airport. 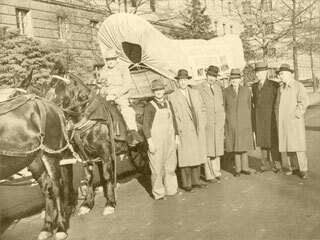 Knowing federal War Relief Act funds were available, and anticipating construction of the airport might help with the local unemployment problem, the Committee agreed to move forward. With the City and County providing the local funds necessary to obtain Federal and State grants, one hundred and eighty-one acres of farmland south of Lititz was purchased later that year. 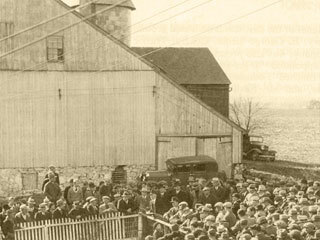 Then on March 15, 1934, with 1,000 people in attendance, ground was broken. While the Lancaster Airport on the Manheim Pike remained in operation, the new Lancaster Municipal Airport was dedicated on August 17, 1935, and was considered one of the finest in the East. The U.S. Bureau of Commerce Directory issued January 1, 1936, described the Airport as having “Beacon Boundary, Approach, and Obstruction Lights…Two hard surface runways each 3,000 feet long and a 3,200 foot sod strip. . . facilities for servicing day and night.” At the time only Pittsburgh-Allegheny Airport had been listed as having both hard surface runways for both day and night operations. The Airport served the County well through World War II, but with the advancement of aviation technology it quickly became obsolete. In order to support faster and more sophisticated aircraft the Airport would need to be enlarged and modernized. In 1944, local officials and businessmen learned federal and state funds might be available for airport construction and improvements. With this in mind The Lancaster Joint Air Facilities Committee was formed and began planning an airport expansion in order to obtain commercial air service for the County. Total costs for the expansion project, including the purchase of additional land and construction of longer and wider runways, would total nearly 1.2 million dollars. Federal and State entities would contribute nearly seventy percent of the needed funds. The City and County would supply approximately fifteen percent, leaving the remaining twenty-two percent to be raised by the community. In an effort to garner local financial support, The General Committee for the Airport Development Project, comprised of 126 of the business, professional, political, and religious leaders of the County, began a drive for funds in March 1947. The campaign was a success. Airline service to Lancaster was inaugurated by All American Airways on March 28, 1949, with TWA commencing service a month later. 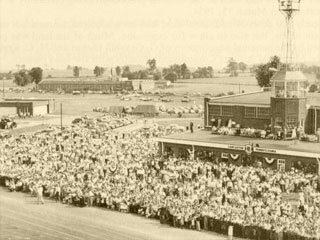 The “New” Lancaster Municipal Airport was dedicated on June 18, 1949. Covering 474 acres with two 4,100 foot paved runways, lighting for night operations, clear approaches, and electronic navigation equipment it officially become known as the “Lancaster Airport” in 1951. Lancaster’s case was presented to the Civil Aeronautics Board by Lancaster Attorney, John W. Beyer, Mayor Kendig C. Bare and Col. J. Hale Steinman. 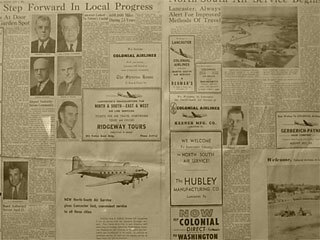 The proceedings were successful and Lancaster received north-south air service on June 9, 1953, a day after the community’s support was highlighted in the Lancaster Newspaper. Today with its private and corporate hangar tenants, on-field businesses, and pilot and fueling services, Lancaster Airport continues to be an integral part of the Pennsylvania aviation landscape and strives to provide quality airline service to Lancaster County. Fly Lancaster It Matters To You and Your Community!